This is another blog-like page in which different elements of lock design will be shown and discussed. High-security locks show a lot of creativity/variety and the purpose of this page is to show that. Newer entries will be at the top for easy access. For random thoughts on how to defeat some of these locking elements, I recommend my Lock Analysis page. If you're reading this, I'm assuming that you know what a normal shear line is (in regard to pin tumbler cylinders). If not that's ok; just cruise over to the Single Pin Picking page for some info. 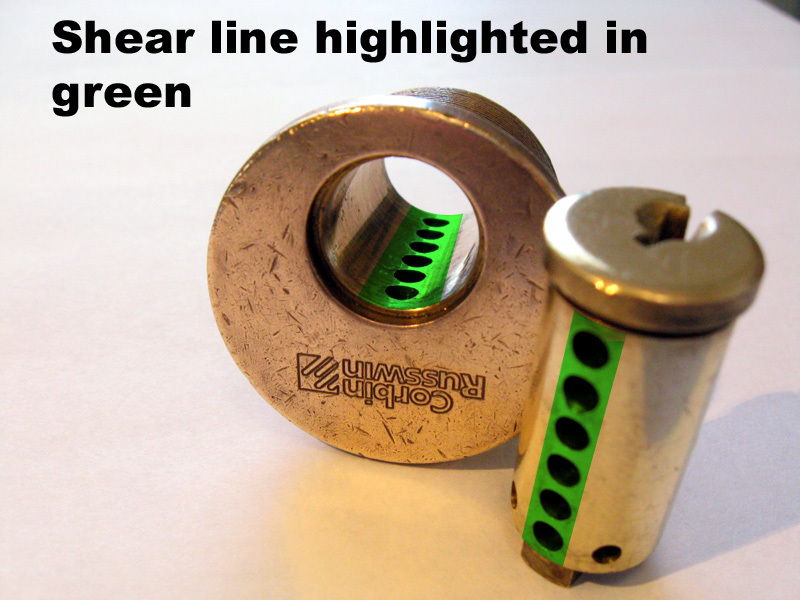 The shearline is that line (or plane) that must bisect the driver and key pins when the plug is turned. Pin tumbler locks operate by accepting a key that lifts (and in at least one case rotates) the pins to create this shear line. Locks that are masterkeyed have more than two pins in each chamber so that more than one bitting at that position will create a shear line. When multiple pin chambers are masterkeyed, it creates many many shear lines and each one makes picking and other attacks easier. Much of the development of high security locks is geared toward keeping masterkeying capability without sacrificing security. Other cylinders utilize shear planes that are strangely shaped. 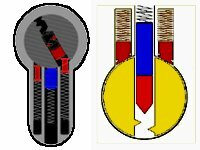 In these cases, the pins and the plug/shell must be made in such a way that they fit to together differently than in normal locks. Odd shear lines are usually a byproduct of the design of a high security lock rather than the focus. 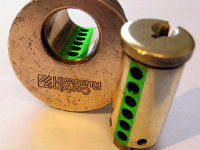 For example, DOM double-row dimple locks have pin stacks that are not centered in the plug; they are on each side of the center line. This means that shape of the split between the drivers and key pins must match the contour of the plug. This further requires that the pins not rotate in place because it would throw off this alignment. I have heard that Mul-T-Lock began milling large rings around their plugs that the pin chamber positions because the pins were relatively easy to cylinder-shim from the front. By shaping their shear line like a wave instead of a straight line; shims would stop working. One of the most complex examples of a strange shear line can be found in the very elegant Corbin Emhart. This is a system that uses lifting and rotating pins somewhat like Medeco but with a very different implementation involving dovetailed interlocking pins. It is a very creative piece of engineering and for now I recommend checking out a fellow lockpicker named n2oah's page about them. Every keyed mechanical lock has a keyway and most are not very interesting. In the high security lock world, things are a little bit different. 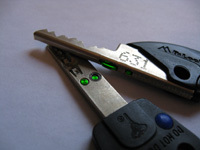 The manufacturers frequently use unique keyways in their lock designs. One motivating factor for this is key control; the aspect of a lock that keeps keys from being illicitly copied. Restricted keys are those that are patented by the manufacturer in order to keep other companies from producing the key blanks. Besides being a good business move, this also means that the key copies are only available from contracted locksmiths (that must follow user authentication procedures to make copies) or even the manufacturer itself. Medeco and Yale produce a keyblank that takes this philosophy a step further; their Keymark key profile is designed to be very difficult to cut with a standard key cutting machine. Paracentric keyways use wards that overlap the centerline (sometimes several times); these overlapping wards make it very difficult to use normal picks. Some of these keyways are also shaped in such a way that the blanks are especially difficult to replicate (even with machine tools). The nastiest of these keyways use overhanging wards which curve back on themselves. Schlage Everest-Primus, along with several others, use these overhanging spaces to implement sidebar systems for even greater security. Some keyways are only shaped in the way they are to allow extra elements to operate. For example, the keyway to the left (Zeiss-Ikon Sperr-Rippenprofil) is not even paracentric but has a unique profile to accomodate some profile pins. Unique keyways do have the disadvantage of making identification of a lock in the field easier. This a really outside-the-box feature of some high-sec locks. Its all about screwing the attacker over after they have successfully picked the lock. One way of implementing this is by adding extra springloaded driver pins around the plug (say at the 45 degree position). When the lock is picked and the plug turns past this position, these extra drivers will shoot down into the plug and come to rest on top of the previously picked key pins. Now if the attacker were picking, this is not much of an issue and these stacks can merely be picked again. But for less flexible opening methods like bumping, this can trap the key,etc.. in the lock (especially if not all of the pin stacks are "trapped". GTV makes a classic trap-pinned cylinder like this and so does M&C (the "Antiklop"). One that I recently found out about is the Japanese Royal Guardian (click for cool video). It's also important to note that these drivers are never meant to be lifted (like normal pin stacks) and set. The already set (and held there by the key bitting) key pins just glide under them during normal operation. This leaves the manufacturer a lot of freedom with the design the drivers. For example, the trap pins can generally be as nastily spooled as possible. They are not bound by limitations like not impeding key insertion or needing a bevel on the edge to ensure smooth operation. This can create a nightmare for the attacker. The more common variety is active and requires that several tumblers be correctly positioned before the sidebar can drop in. The typical movement required is that these pins (called sidepins) must be lifted to the correct height before the sidebar can fall into their gates. Assa Twin uses a series of especially nasty serrated sidepins with a deep ring cut in them that acts as a gate. All of these sidepins must be lifted to their correct heights before the sidebar can drop in and allow plug rotation. In this case, the normal pin stacks must also be picked. 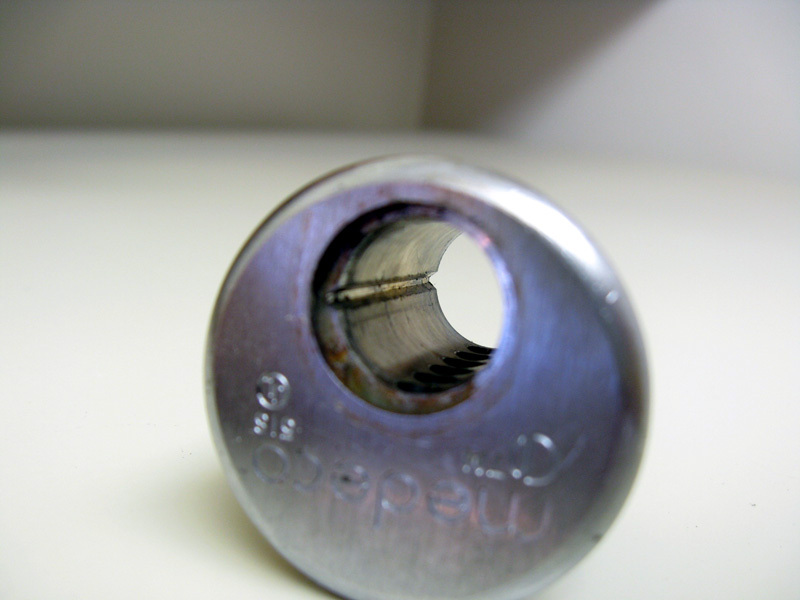 Schlage Primus has a similar mechanism that also requires the fingerpins (sidepins equipped with small fingers) to be rotated to one of three angles. Bilock employs two sidebars (one on each side of the plug) with 6 sidepins each. 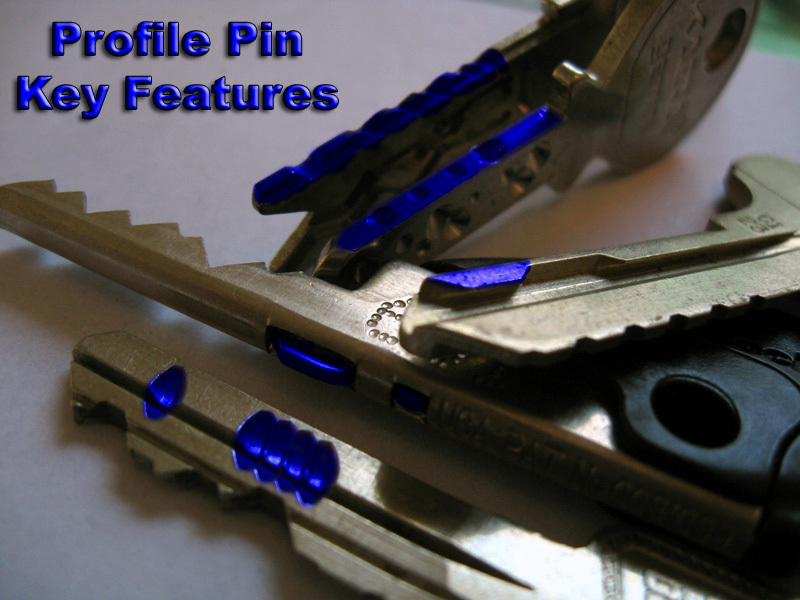 Medeco makes use of the normal pin stacks for its sidebar who's function is to check that each pin is properly rotated to one of three angles (set by angled cuts on the key). There is nothing magical about sidebars and their pickability, the sidepins will still have tolerance errors that allow picking. However, these cylinders tend to make their sidepins difficult to pick by using a variety of methods. False gates are common and can really make defeating the sidebar a pain. Also consider that the position of the sidepins can be very low in the keyway (or in some other odd position) and may need to be moved in some unconventional manner. Sidebars allow a lot more creativity in the design and thus provide new challenges for attackers. Medium and high security locks are not built only for manipulation/picking resistance. 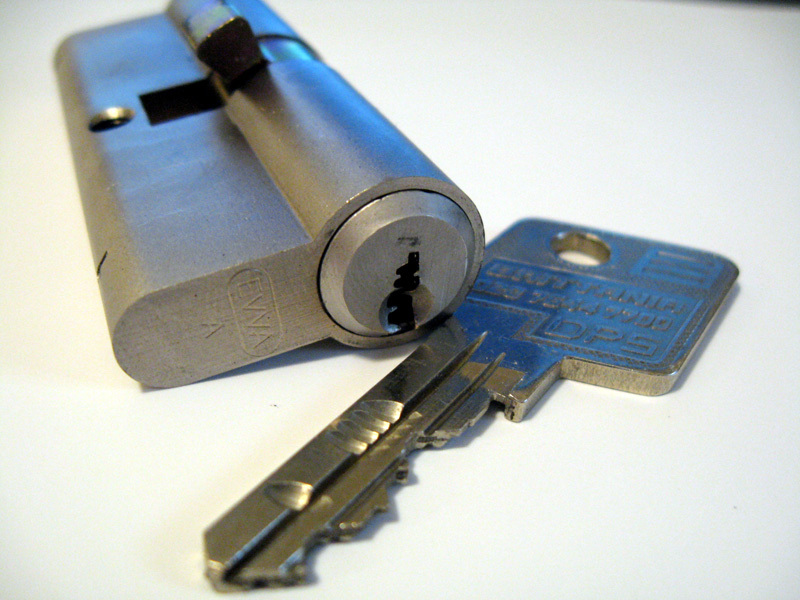 An important reason that people choose high-sec locks is improve key control. This is the degree of difficulty that exists for obtaining unauthorized key copies. There are various levels of key control including patenting key profiles for legal protection against duplication. The level that we care about is mechanical key control. A lock is said to have good key control of this variety if it is physically difficult to duplicate its keys. This can accomplished by making the profile of the key intricate and complex so that its hard to make a copy that will fit the keyway. Profile pins (esp. passive and check pins) are designed almost exclusively for key control rather than pick resistance. They check various parts of the key only to ensure that the correct keyblank is inserted and are not concerned with the main bitting. Most keyblanks/keys can be copied using a key-profile cutting machine or a mill. An exception to this rule are keys that use floating elements. These are parts of the key that can move around in some way. More importantly, these elements must move in that way in order for the lock to open. This usually works by including an active profile pin in the lock that must be lifted to a point above the level of the key. This means that no ordinary piece of metal can be milled that will set that pin and still fit into the keyway. However, if a floating element is present it can enter the keyway and then once inside move to a point that it can set the active element. The good news about these types of floating key elements is that they are typically easy to pick. But if you plan to construct a tool (for decoding perhaps), these mechanisms must be dealt with. Mul-T-Lock Interactive does this using one of the main pin stacks rather than a profile pin. There is a floating button-like piece in MTL Interactive keys that is pressed into the high-setting pin stack by a spring loaded pin from below. 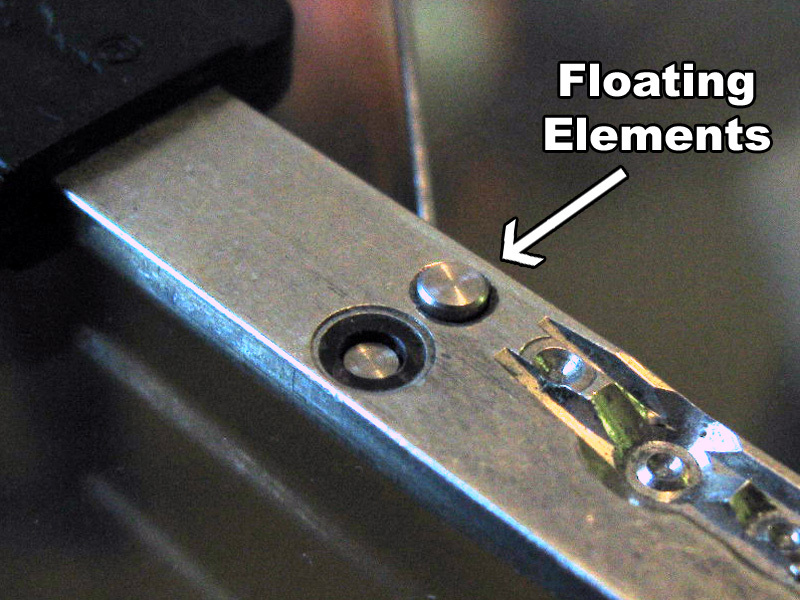 Bilock NG is another lock that uses a floating element to enforce key control. In these locks, there is a sidebar block bar at the front of the keyway that must be lifted. However it must be lifted higher than any normal U-shaped keyblank could. That's why the key uses a small pivoting lever that is retracted during key insertion and then pivots to lift the element once inside. In some medium and high security locks, there are other elements of locking mechanisms besides the main pins/wafers/levers/discs/etc... (all called tumblers by the way). A common secondary element is the profile pin. 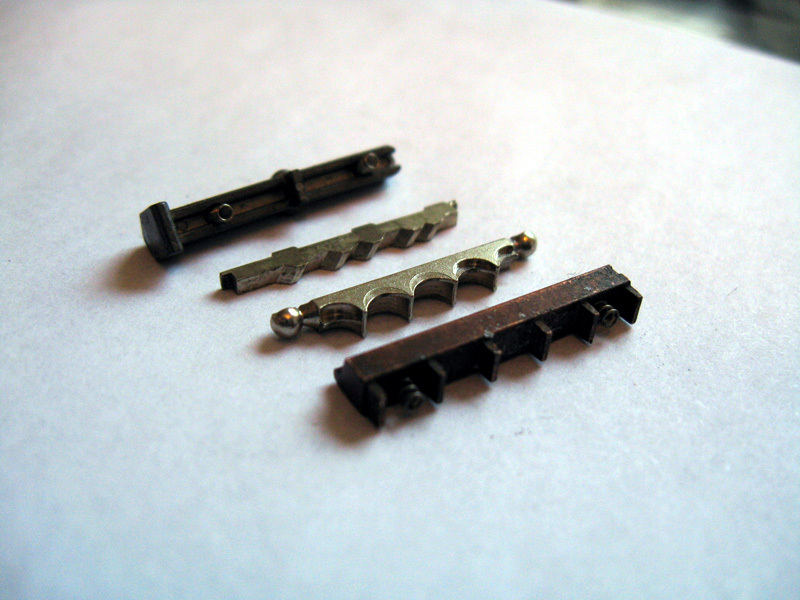 These are usually pins that check the shape of a different part of the key than the main pin stacks. 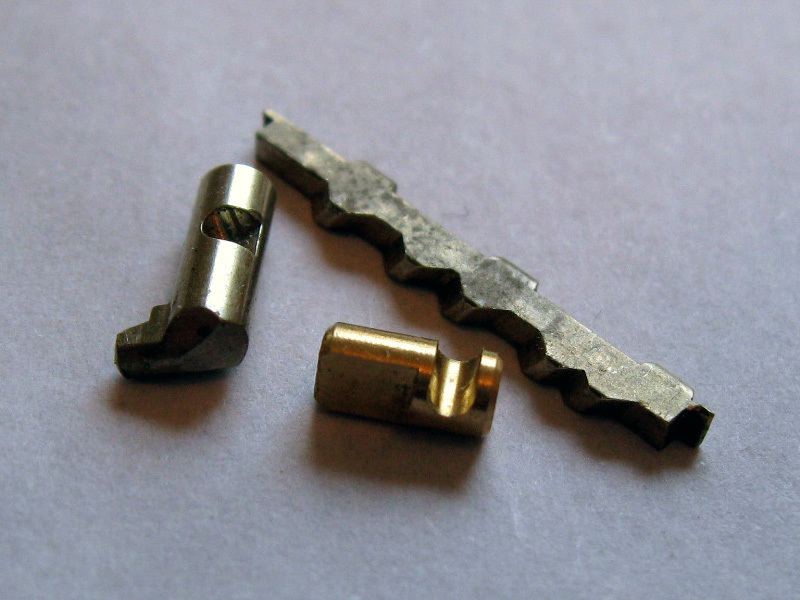 On modifications to the standard pin tumbler lock design, profile pins that check side of the key blade are perhaps most common. One type are passive profile pins; these are pins which do not block the plug from rotating in their default position. In other words, when a key is not inserted, they are not preventing the lock from opening. However, if a key with the wrong profile is inserted, they will be pushed out and block the plug from rotating. When picking or decoding these pins they should not be depressed and can be mostly ignored. The other category of profile pins are called active. These are more like normal pin stacks in that they must be lifted/depressed because they block plug rotation in the default/no-key position. The mechanism used to enforce this is not typically a "normal" stack of two pins and more commonly employs a sidebar-like element. In fact, the sidepins in locks like the Assa Twin, Schlage Primus, and Scorpion CX-5 could be called active profile pins. In these systems, the profile pins must be precisely positioned. Active profile pins called check pins are more forgiving and simply need to be lifted/depressed beyond a certain point. Schlage Everest uses a blocking pin like this that must be lifted by a step on the key.